How to Use Secondary Pools for BPMN Task? Current: How to Use Secondary Pools for BPMN Task? Under normal circumstances, we assign merely one pool to a task in BPD. However, in some cases, you may want a task being able to be done by more than one role, in this case, you can assign secondary pools to the task. In this tutorial, we will demonstrate how to assign secondary pools to a task in BPD with Visual Paradigm. Download Simple-Clinic.vpp. You can also find this file at the bottom of this tutorial. Open the business process diagram Patient Registration. Assume you find Check Body Temperature task can be done by either the nurse or the patient. In this case, you can assign secondary pools to the task. 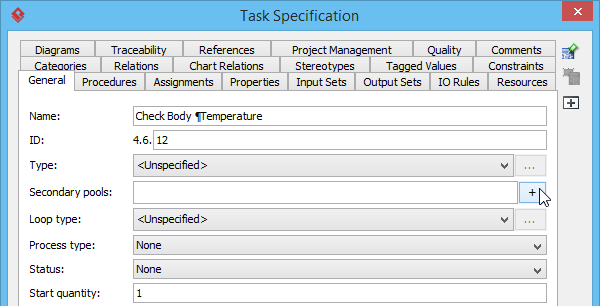 Right click on Check Body Temperature task and select Open Specification... from the pop-up menu to open Task Specification window. In the Task Specification window, open General tab. Click the plus button in Secondary pools. The available pools are listed in the Select Secondary Pools window. 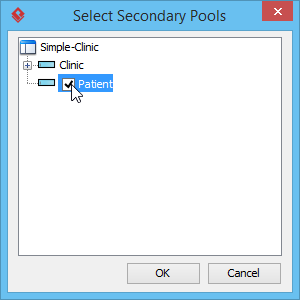 Check Patient pool and then click OK button in the Select Secondary Pools window. 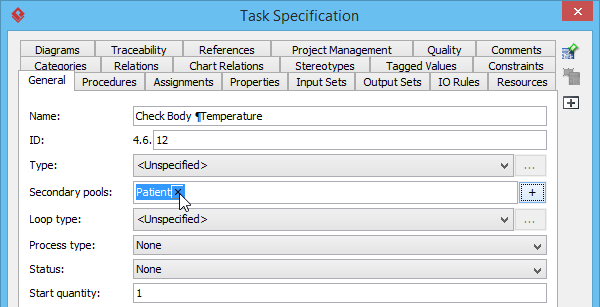 Subsequently, click OK button in the Task Specification window. Let's say later on you find that checking body temperature should be done by the nurse only, you can remove the Patient pool by clicking on the small cross button next to Patient. Watch another example in YouTube.